Janet proposed this unique field-study program based on her long experience in West Africa and her Fulbright research methods. She worked with Antioch College to develop the program from 1999 thru 2001 and directed the program from 2002 thru 2006. The program is ongoing. The central part of the program was an apprenticeship where participants worked with an visual artist or performer in their field of interest to experience Malian artistic practice and to explore Malian culture by developing a relationship with an individual, their family and the culture. This form of learning works in an art program since even with a minimum of language, exchange is possible thru demonstration and observation. I believe this was the only semester long international program to West Africa specifically for studio visual and performing art students. 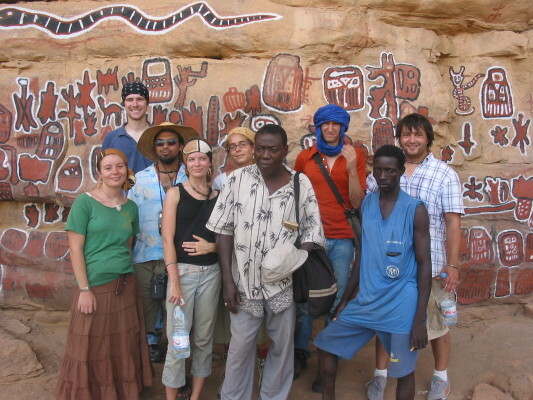 This unique field-study program used visual and performing arts to develop cross-cultural understanding, critical thinking, and a foundation for better understanding of both American and Malian culture. Using art as a cross-cultural tool and a means of self-expression, students became familiar with contemporary Malian life which is influenced by ongoing traditions from the 12th century and earlier, Islam, the fading but ever close presence of colonialism, the persistent reality of contemporary neo-colonialism, and the complexity of globalization. By focusing on the intermingling of traditional and contemporary issues, the Art and Culture in Mali, West Africa program offered a context within which students are immersed in Malian culture and way of life. This one semester program provides participants with a model for understanding and entering other cultures. It can also lead to a better understanding of one’s own culture. It can enlarge and enrich students artistic practice by enlarging young artists’ notions of the world and its possibilities, providing other notions of working methods, decision making, of community vs individuality, Besides assessing the student’s artistic production the experience is assessed and documented through the student’s knowledge and sensitivity toward understanding and acknowledging cultural differences, including customs, social behavior, issues of gender, class and ethnicity, historical heritage and institutional structure of Malian culture. The true impact of study abroad, perhaps especially in a culture as different from our own as Malian culture takes many years to blossom.